Till date there are millions of Mumbaikars who has MTNL land line at their home and business locations since in many case the land line phone bills are asked and are used as legal proof of residence / office. The reasons keeps many citizen intact with land line phone. Broadband facilities brings a hassle free internet connections in this case as complete billing for Triband usage and regular calling charges are included in single bill that saves lots of time. Mumbai people can enjoy flexible annual and monthly plans as per their convenience to enjoy super speed broadband internet. Post paid service, which means payment of usage is done later when bill arrives. Minimum speed will be 256 kpbs (Goes upto 4 mbps depends on broadband tariff plans selected). Separate telephone and internet usage in same line, Which means if using broadband services, One can call and received phones also. If broadband service down for some reasons, Phone calling still works. Some of the already active value added services included. Most important feature ‘Value For Money’. Yes MTNL’s broadband or any internet plans are a real value for money for citizens. 24 hours helplines and support. MTNL provides various ways to get their broadband service at your door steps, You can call on 1500 from any MTNL phone and ask for new connection, Alternately visit any nearest telephone exchange office, Download triband form from their site and apply. The recommended method is to visit nearest Exchange office. Broadband ADSL routers and kit is provided by them to get started within 15 days. Recently MTNL also started their broadband prepaid plans and services for their existing customers having copper infrastructure on landlines. They take initial installation, activation and one time charges for all that includes MTNL modems too for a valid period of 90 days. You need to refer their prepaid tariff plan section for details. 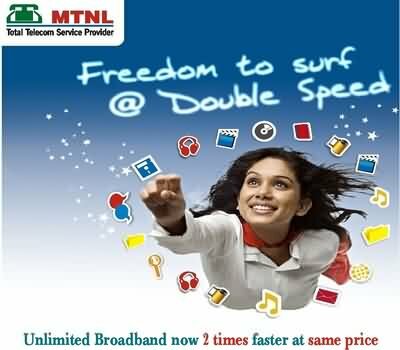 MTNL has multiple broadband plans for its Mumbai customers, some of them are Tri band tariff plans, Combo plans, VDSL broadbands, Temporary and Casual broadband plans, Special BB tariffs for Honorable MP’s, Special plans for staff members (DOT Staff) and l2 VPN service plans.